Did winter disrupt your routine of going to yoga classes at the studio? Or maybe you've fallen off your home yoga wagon and need help getting back on the mat? In any case, we're here to help you reboot your practice (or finally start one!) by giving you a chance to win free access to DOYOUYOGA Premium for one whole year. This means you get complete and total access to the entire DOYOUYOGA library! Get your yoga on wherever, whenever with a DOYOUYOGA Premium subscription. You can deepen your practice with Kino MacGregor, detox with Jessica Rose, try Power Yoga with Leah Cullis, tone your body and breath with Briohny Smyth, or even add Pilates to your workout with Sam Harris-Hughes. You'll get to access them all for free! The giveaway runs from Thursday, April 6, 2017 to Wednesday, April 12, 2017. 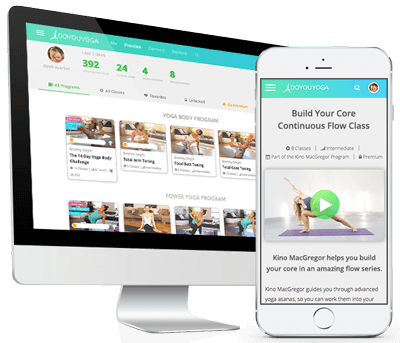 Three randomly selected users will be chosen to win a free, one-year premium subscription to DOYOUYOGA. So make sure to share and comment to enter!